Dr.Sopon Pornchokchai, President, Agency for Real Estate Affairs as the President of FIABCI Thailand would like to announce the nomination of the FIABCI-Thai PRIX D’EXCELLENCE AWARDS 2019 to give recognition to outstanding best real estate projects in Thailand. We have invited respected people in the field of real estate and other related disciplines, business and academy (local and foreign) to comprise the panel of judges. Your entry/entries will be judged based on the following criteria: General Description of Project, Architecture and Design, Development and Construction, Finance, Marketing, Environmental Impact, Safety & Maintenance, and Community Benefits. Winners of the said awards shall be endorsed to the FIABCI-Thai PRIX D’EXCELLENCE AWARDS 2019 for the best international real estate projects (14 categories) to be held in Manila, the Philippines in May 2020, during the 71st FIABCI World Real Estate Congress, an annual event held by The International Real Estate Federation (FIABCI) based in Paris. The winners of FIABCI World Prix d’Excellence Awards will gain access to international platform. FIABCI is the French acronym for "Federation Internationale des Administrateurs de Bien-Conselis Immobiliers", which means "The International Real Estate Federation". Founded in 1951 in Paris, In its 68 years of existence, FIABCI has built an enviable reputation. FIABCI is a worldwide business networking organization for all professionals associated with the real estate industry. With chapters currently operating in more than 60 countries, FIABCI represents every discipline in the industry and links thousands of real estate professionals worldwide. Candidates wishing to participate in the FIABCI-Thai PRIX D’EXCELLENCE AWARDS 2019 should send their application to the FIABCI-Thai by May 24, 2019. The Awards Committee/Judges reserves the right not to confer an award in any given category if, in its opinion, no project submitted in that category fulfils the judging criteria to a sufficiently high standard. The project must have been completed and fully operational for at least 12 months before the deadline for receipt of Application Forms. If the project comprises several phases, at least 1 phase must be complete and operational before submitting. There will be no reimbursement of expenses relating to the submission of a project. FIABCI-Thai reserves the right to use the photos and extracts from the submissions of the winning projects for the Awards. Photos and video footage from the submissions may be used in the final presentation and/or magazine/brochure. The awards will be announced and presented during the Awards Gala Night. The winning projects will be notified prior to this time and the award winners must attend the Awards Ceremony to receive their award. The committee reserves the right to withdraw the awards, if the winners refused to attend the Awards Ceremony. Press releases announcing the award winners will be distributed to the media. Winning projects are refrained from circulating press releases concerning the results until AFTER the official announcement has been made at the Awards Gala Night. Announcements of winners will not be made until after the Awards Gala Night Presentation Ceremony on July 7, 2019 where the President of FIABCI International and other international guests would be invited to join. A company can enter as many projects as it chooses. The awards are made on the basis of the overall excellence of the development. 6.1 Environmental (Rehabilitation / Conservation) Category - Project that rehabilitates an environment or to conserve existing environment. 6.2 Heritage (Restoration / Conservation) Category - Restoration or conservation old buildings that have been identified for Heritage Conservation. 6.3 Hotel Category - Business type or leisure type, service apartments that are strictly operated as hotel, etc. 6.5 Industrial Category - For industrial building, industrial parks, technology parks, warehouse, factory, workshop, etc. 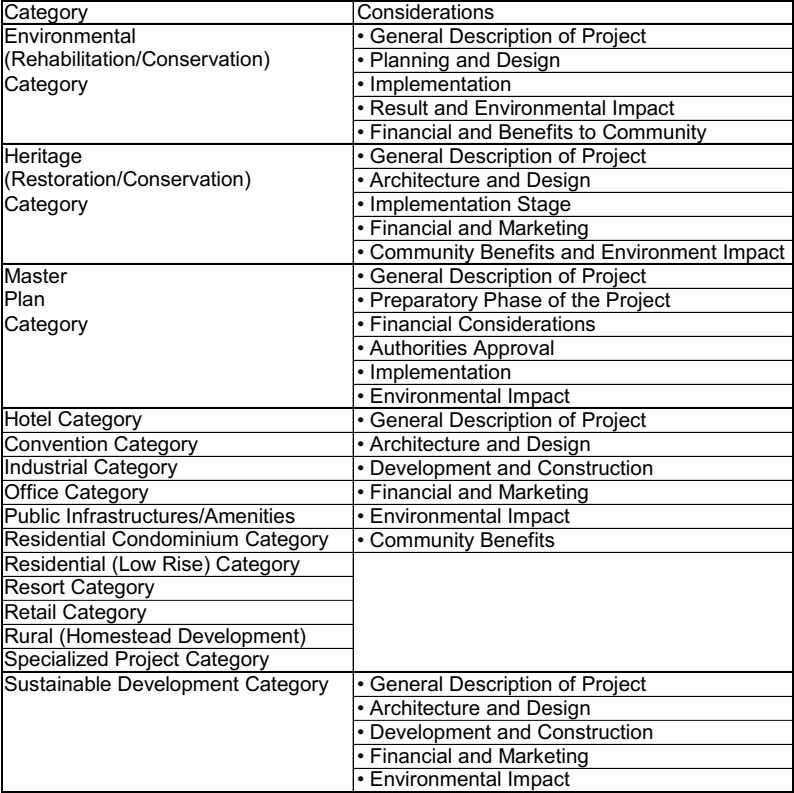 6.6 Master Plan Category - For a development concept plan, i.e. township development and housing estate development. 6.8 Public Infrastructures/Amenities Category - Project developed by public fund: government buildings, hospitals, road, bridges, stadium, etc. 6.9 Residential Condominiums Category - Owner-occupied Apartments. 6.11 Affordable Housing - Housing for the lower income group. 6.12 Resort Category - Beach resorts, hill resorts, theme park, marinas, etc. 6.14 Rural Development Category - Forestry, farm developments, etc. 6.16 Sustainable Development Category - For energy saving project, i.e. save energy feature, building allow more natural lighting, conserve or harvest rain water for use. A) An Application letter with a text describing the project in 100 words which will be used in the magazine/brochure when your project win.